Hemostatic effect is regardless of blood coagulation processes in the body and caused by binding of positively charged elements of dressing material with negatively charged erythrocytes. 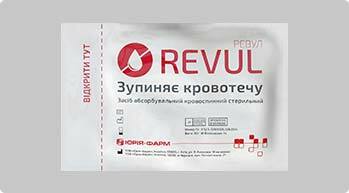 When contacting with blood, hemostatic dressing Revul (Ревул) enhances the absorption of blood liquid fraction and forms a single gel-tremellose mass, thus facilitating the hemostasis. When the powder interacting with blood, Revul forms hydrogen compounds with water (as blood consist 90-95% of water), which leads to the aggregation formed elements of blood and clotting factors at the site of contact followed by the formation of a blood clot. This occurs due to the large molecular weight of molecules, which are full of the hydroxyl groups. 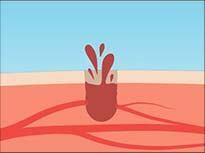 The average time of a dense clot formation varies between 25 and 30 seconds. A nonwoven material based on the pure chitosan, but not impregnated synthetic material, is used. Chitosan meets international standards FDA GRAS (Generally Recognized as safe). It does not mix with blood and does not get into the lumen of blood vessels. Chitosan shows the effect regardless of blood clotting processes in the body. 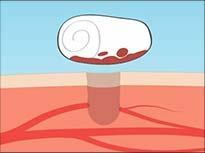 It has a large useful area of contact with the surface of a wound for rapid bleeding control. Optimal area of the gauze for use in large and medium-sized wounds that are the most difficult for the patient. Concentration of chitosan for rapid haemostasis is not less than 100 grams which increases the speed of haemostatic effect. It meets NATO standards applying to haemostatic gauze for military personnel and is suitable for use in peacetime. Effectively stops the bleeding of different intensity in 5-10 min. Does not affects blood clotting factors, is effective in the conditions of anticoagulation. Does not affects hemostasis directly. Creates a clot in the presence of heparin and indirect anticoagulants. Revul does not adhere and does not stick to the damaged tissues. When the doctor removes the clot, Revul easily washes away with the saline. Then treat the wound according to the approved medical standards. 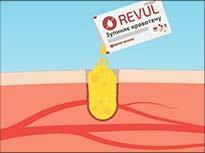 Revul does not cause a thermal reaction at the site of application and does not cause burns. Probability of allergic reactions is very low, as in human body no enzymes that can split the main components of REVUL. Take the REVUL® hemostatic dressing pouch, check the package integrity, open the pouch and take out the dressing. 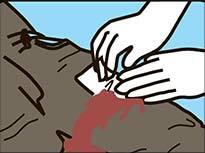 Perform a tight tamponade of the wound, preferably, above the source of bleeding. 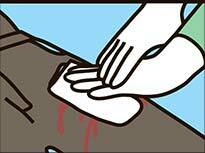 Leave hemostatic dressing in the wound. Rests of the dressing can be cut off or pick off if necessary. DO NOT DISCARD THE EMPTY PACKAGE! 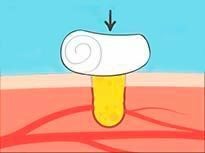 Press tightly a gauze tampon to the wound for 5 minutes. 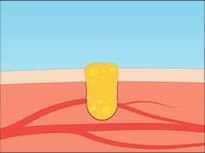 Apply a compressing bandage to the wound. Seek medical attention at the nearest first aid station as soon as possible. Give the empty pouch to medical professionals. Do not use the remainders of the roll gauze. Wound in the start of bleeding. To provide maximum contact of powder with the damaged vessel clean the wound from the foreign bodies, blood clots. Fill the wound with package content. DO NOT DISCARD THE EMPTY PACKAGE! Press firmly to the wound with a bandage or gauze pack for 5-7 minutes. 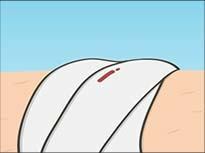 Apply a pressure bandage on the wound. Do not throw an empty package! 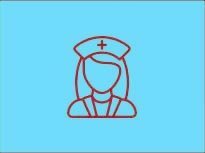 It may be needed by medical personnel to identify a haemostatic agent. 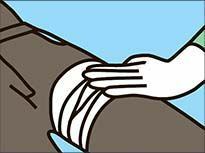 As soon as possible, take the patient to the nearest first aid. 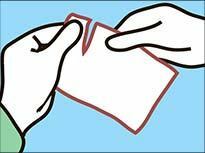 Pass an empty packet to medical professionals. Do not use any powder residue. “We decided to organize provision of Revul, first of all, to 93-rd air mobile brigade, who is located at one of the hottest zones – village Peski near Donetsk. “Efficacy of Revul is demonstrated in our research on bleeding models of different localizations, including heavy arterial bleeding model. REVUL approved itself as an efficient hemostatic, has shown positive profile of influence on laboratory parameters, which characterize hemostasis system. “I would like to tell about an analogue of Celox but manufactured in Ukraine. The guys brought it to us for the soldiers’ first aid kits. We like a new haemostatic as it is manufactured in Ukraine and is much cheaper than its analogues. I wish every soldier had it in his first aid kit. And it makes me even more proud that this product is manufactured in Ukraine! 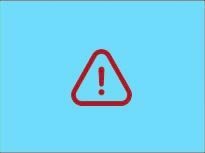 “One of the main elements of our first aid kits, which we assemble for soldiers who stand at checkpoints and forefront positions, are haemostatic products. In particular, we were given a few samples of haemostatic Revul for testing.